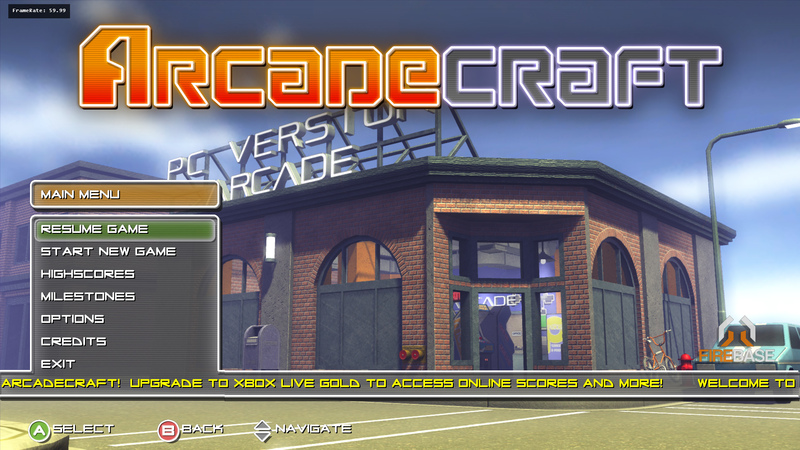 It has been 3 months since Arcadecraft first went on sale on Xbox Live! Sales have passed 30,000 and briskly heading towards 40,000 copies now that the game is on sale for 80msp. At that price we are getting a 91% conversion rate as well so for every 100 trial downloads we are getting 91 sales! We thank you guys for all of your support! Without such a great community of players AC wouldn’t be what it is and what it will be. Thank you for all of your emails, comments, tweets, etc. We read all of them and try to respond as best we can. In regards to the next content update, rest assured it is coming along. The biggest holdup to the process, though it sounds ludicrous, was that I was struck by terrible seasonal allergies that made the month of March a near complete creative write off. While Sam was happily coding away building in the features for the game, I was clawing my eyes out and falling asleep at my desk. Since April production has ramped back up and I’m doing my best at playing catchup. Thank you for your patience and don’t plant alder trees. We want to talk about the PC version of Arcadecraft as it is one of our more requested topics. To start off, here are two screenshots straight from the PC version as it stands right now. As you can see, there are no characters in the scene and the UI is still Xbox controller centric. On the positive side, you may notice that the UI is full 1920×1080 without a hint of upscale. This doesn’t even represent what we could do with a true PC version as most of the source textures in the game are also available in 4x the resolution you see here. This brings us to Steam Greenlight which is where you can currently find PC representation of the game. Arcadecraft was put on Steam Greenlight back in October of 2012. In the first week the metrics were looking really positive, surpassing our first game, Orbitron: Revolution quite easily. Unfortunately they dropped off rather quickly. When Arcadecraft was released on Xbox 360 and media picked up on the game we saw an increase in Greenlight views again though nowhere near the scale as when it first appeared. 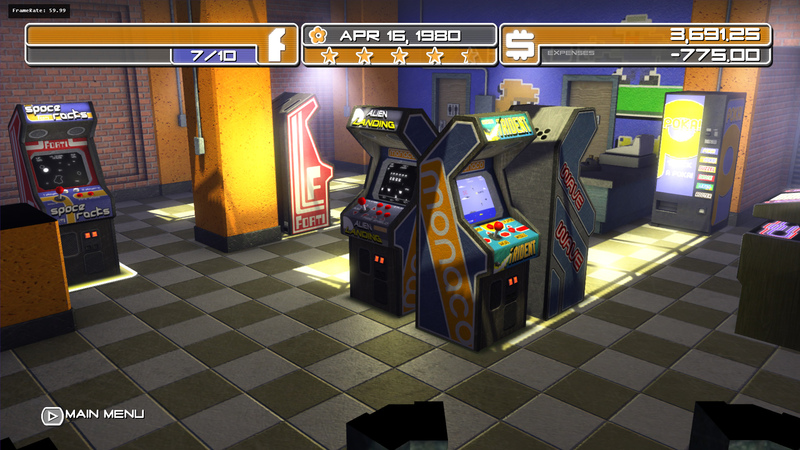 Seven months since Arcadecraft was put up on Greenlight, it isn’t any closer to becoming available on Steam. It is sad and unfortunate for us and for the people who really would like to play it. We put a lot of work into writing the game so it could port to PC given the money and time. However we have to maintain a responsible and sustainable business and we cannot pin our hopes on the game passing through Greenlight sometime in the far future. To that end, we are pulling the game from Greenlight on the 16th of May if it doesn’t make progress and move into the top 100. You may think that setting a hard date and taking away the game is simply childish and a ploy for attention. We can see how you might come to that conclusion but I’ll do my best to explain why this is happening. If we were to continue development of Arcadecraft for PC and bring it to a completed state we believe that it would take about five to six months of development and approximately $22,000 to cover overhead and raw costs alone. That doesn’t include any salary for us. So nothing towards mortgages, families, or other personal financial responsibilities. This time and money would go to adding mouse support, building the PC UI, full graphics options, rebindable keyboard, character models, character textures, character editor UI, online integration, platform testing, and many other issues. Without a guarantee of distribution and sales that cost is far too much to bear. It is also unfair of the Xbox version to carry the costs of the PC version as it was done on its own budget for its audience. It also represents the brunt of the actual income the company makes. Why not go Kickstarter? Well we are a Canadian company and Kickstarter is unavailable to us unless we bring in a US middleman. We would much rather have every dollar of support pledged go toward the game instead of helping the middleman with the added tax burden they would take on. Also, without a guarantee of a sales portal after the fact the cost would have to include a salary for us, pushing the total a lot higher. Please remember that Firebase Industries is only two people, Sam and myself. As Arcadecraft is winding down we have begun preproduction on our next game as well as entertaining other business opportunities. Once we start full production of Game Three in a couple of months, we are not going to stop until it is finished. You may ask why we make games for the Xbox 360 instead of anything else? Mostly because we find it is the easiest route. First, the XNA framework, C#, and the Sunburn Engine all give a really nice headstart to development. Second is that it is a single sku platform. All Xbox 360s are essentially equal and you can guarantee the controller for the primary input device. Third is that as long as we don’t make anything offensive we are guaranteed a spot on the Xbox Live Indie Games Marketplace as well as a chance to land on Xbox Live Arcade if we can get our quality, contracts, and dates aligned with a publisher. Other options for development for us do exist and we may be pursuing iOS, Windows 8, Next Xbox, PS4, Ouya and other platforms in the future depending upon details of how open their marketplaces remain or become. Also, matching the game with the right financial model is important to us as there is a distinct and real shift taking place in the game industry. In closing we are just as disappointed as you are that a PC version is an unlikely reality. We think it is a great match given the success and audience for UI centric, Tycoon style games on the platform. On the other hand, the response to the Xbox version of Arcadecraft has been phenomenal. We had a ton of fun making the game and continue to work on updates for it. Best news of all is that our third game has started and we hope it is something you are going to enjoy! It will also port a lot easier to multiple platforms. Any update on when we should expect the next content? I was so overjoyed that you were going to be releasing on PC, I was really looking forward to it and was constantly checking the site for updates. Eventually time just dragged on far too long and I simply gave up, imagine how bitterly disappointed I am to later think “Oh wow, what about ArcadeCraft? Perhaps it’s finally finished and coming soon! ?” then check online and find that not only has the XBLIG version been out for a crazy amount of time now, but that you’ve just wiped away any hope of the PC version. Imagine that. Seriously, this is beyond disappointing guys, what makes it worse though is the reason why you’ve just said “Sod it, PC users can sling their hooks” — all because of Greenlight. I can’t even begin to express how…. well… how childish that is. Such a wonderful idea for a game, totally unique and appeals to so many classic gamers, but to be told that we’re never going to see it because you didn’t get enough “votes” is horrible. What about Desura? What about GamersGate? What about GOG? There’s a myriad of other sites and distributors you could have gone to in order to get the game out there with the least amount of fuss possible.. Steam is awesome but it’s not the be-all and end-all … hell, you could have launched it on your own ecommerce store. Nope, sorry, no Steam no game for you. Wonderful ultimatum there, one that has backfired and not only cost many of us (especially those that actually DID vote and DID spread the word!) a chance at the game but also yourselves at an extra revenue stream. I’m not buying the XBLIG game, not at 420msp and not at 80msp, because I abjectly refuse to validate Microsoft’s hateful practice of forcing people to have persistent net connections in order to play their legally purchased content. Had you have released this on XBLA I *may* have been more inclined to purchase since the online requirement is not present, though it’s still rather unlikely due to the limitations on hardware that you’re experiencing now with the framerate issues and dozens of cabinets at once. I’ve already wasted far too much money on XBLIG titles that I can no longer play unless I connect to XBL so I have no intention of wasting more, even on a worthy game like this. I had my hopes pinned on a PC version, which have now been dashed. Bitterly disappointing. I guess our “lack of business” hardly matters to you since there were supposedly so few of us, perhaps another company will pick up on the idea and put out a clone for everyone else? Oh well.. best of luck to you in the future.